If there's anyone that loves to wear black from head to toe it's me. It's so chic, so timeless and let's be honest, so easy. Now that the temps are dropping, it's time to layer, layer, layer! I love a cowl neck sweater, especially when worn with skinnies and a great jacket. My cowl neck sweater and skinny cargo pants are both from T.J.Maxx and they're both designer. When I say designer, I mean two of my all time favorites. How great is the zipper detail on my pants? I love that they can be dressed up with a pair of pointy toe heels or dressed down with a pair of boots. I also love that I got them for a fraction of the original retail price. Same goes for my sweater too. My drapey leather jacket was just the piece I needed to complete my layered look. The more zippers the better in my opinion! I've said it before and I'll say it again. Make sure you check out the beauty department at T.J.Maxx. 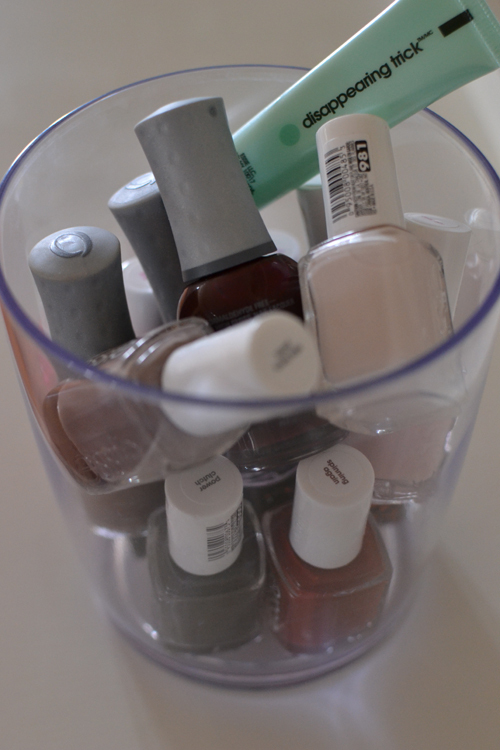 See all of these top brand nail polish colors? They are ALL from T.J.Maxx. The price was so incredible that I had to get them all (plus a top brand cuticle treatment)! Oh, and don't get me started on the professional shampoo and condition I scored there too. Amazing. LOVE this all black look! Those pants are great! Love an all black look. Okay, you know I LOVE this look! Even more jealous of your J.Crew Everly's (which I think these are) now that you're wearing them. I have to hunt them down on sale! Ha, yup...I'm wearing the Everly's. Love them! Love this all black outfit, Audrey! gorgeous! love the all black!! xo, elle | Living in Color Style blog. The black on black is perfection! I have scored some amazing beauty products at TJ's! Not to mention Michael Kors perfume!